All Christians are called to holiness in virtue of their Baptism. 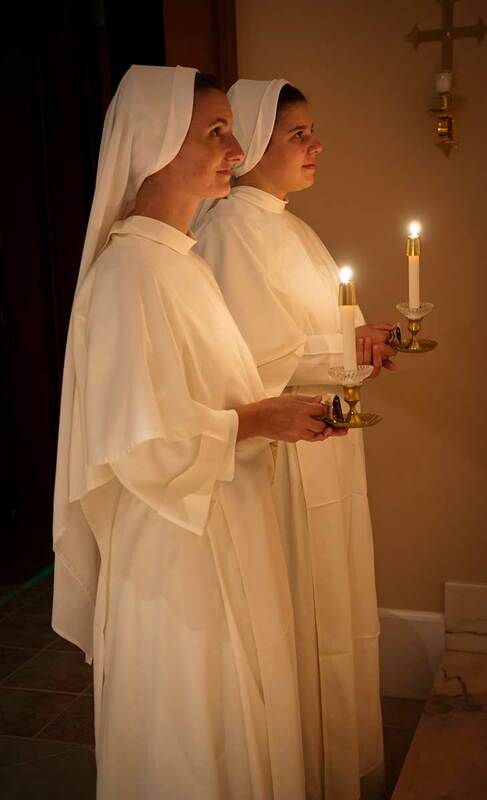 Flowing from the Baptismal call, the religious sister is called by God in a unique way to witness to the priority of that life for which we have been made, eternal union with God. 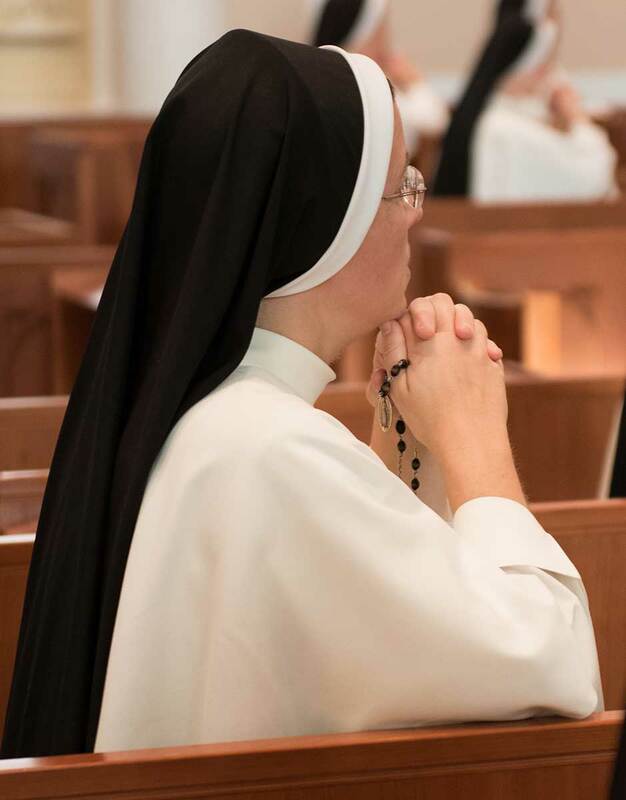 In order to mature in her vocation and live more deeply the life to which God has called her as a Dominican Sister of St. Cecilia, a young woman goes through years of religious formation. 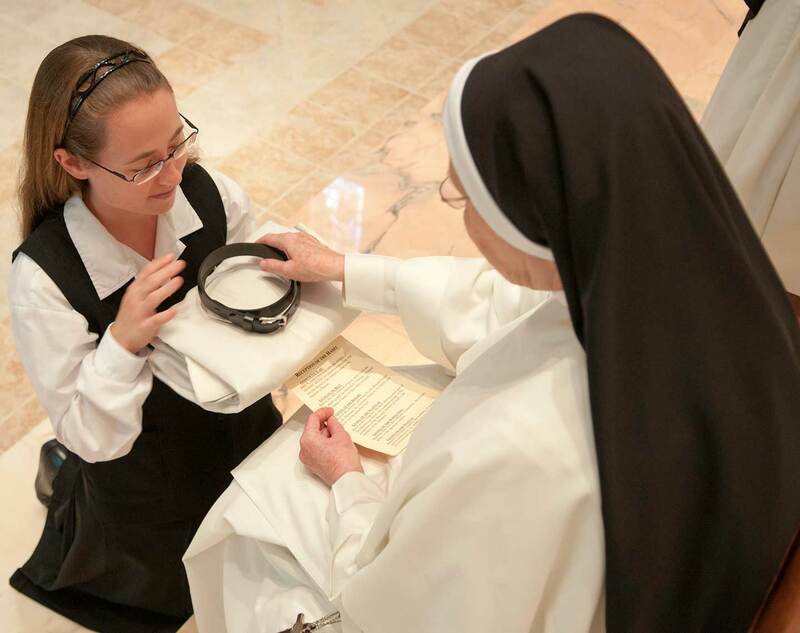 The first seven years of her religious life are a preparation for her profession of perpetual vows. The formation process is that of becoming more and more like Christ, growing in union with Him, taking on his mind, and sharing in his sacrificial gift. It is a process of conversion, one leading to the perfection of charity. 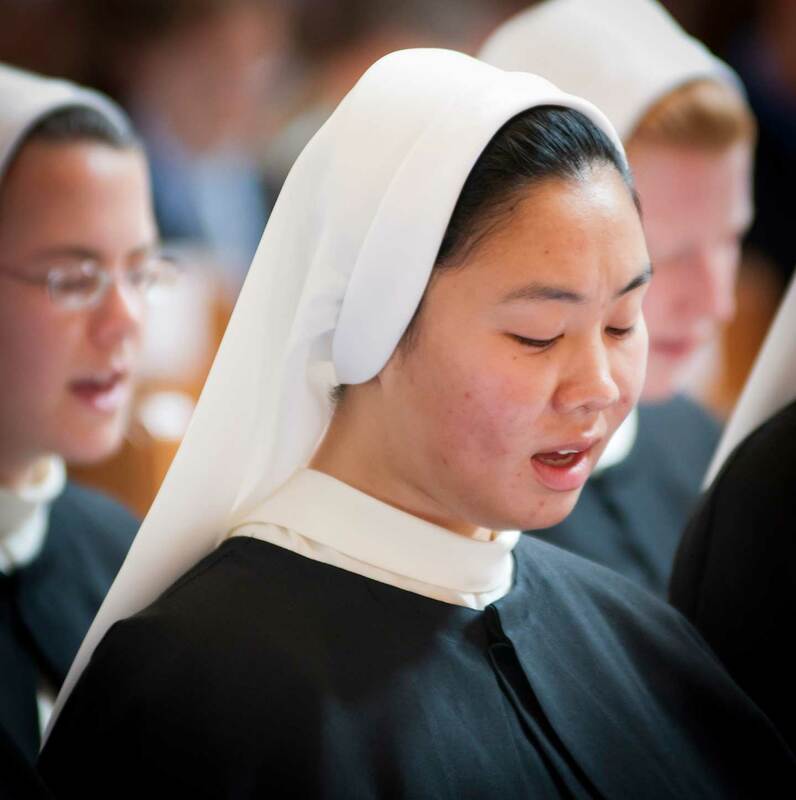 The formation in the religious life is a lifelong journey. 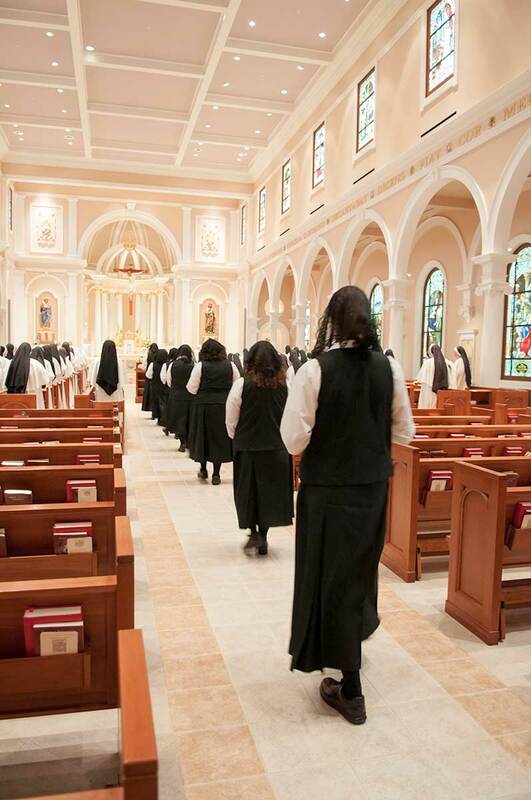 Thus, we participate in a formal program of formation before and after profession of perpetual vows, seeking to cultivate perseverance and fidelity. The young woman makes initial contact with the community, either in person or by phone, letter, e-mail, or the website. The candidate speaks with the Vocation Director. 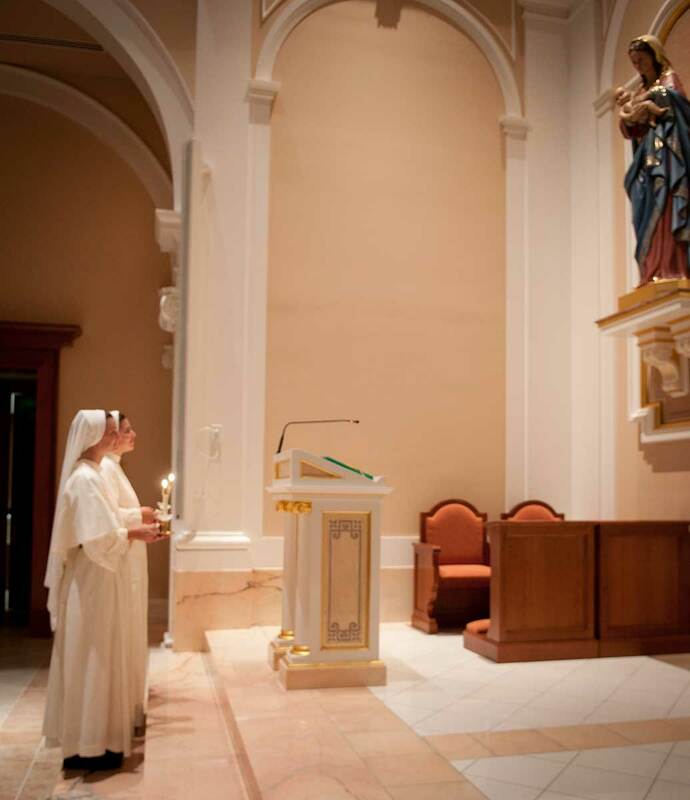 In order to see the life, she visits the community or attends a retreat at the Motherhouse. 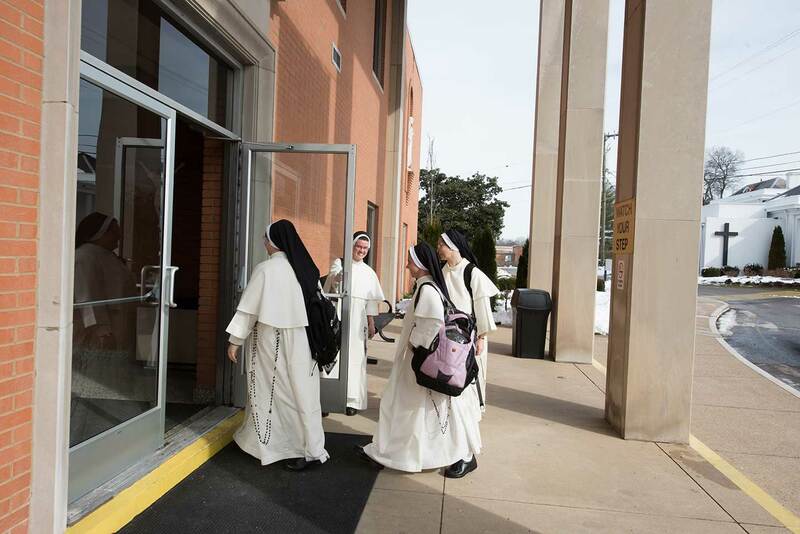 While at the Motherhouse, she may have an interview with the Director of Novices and the Prioress General. The candidate may request an application. This application process entails completing an information form; sending school transcripts, medical forms, Baptismal and Confirmation certificates; a letter of recommendation from a priest; a personal statement of the applicant’s motive for entering religious life; and a psychological evaluation. Status regarding acceptance is communicated. 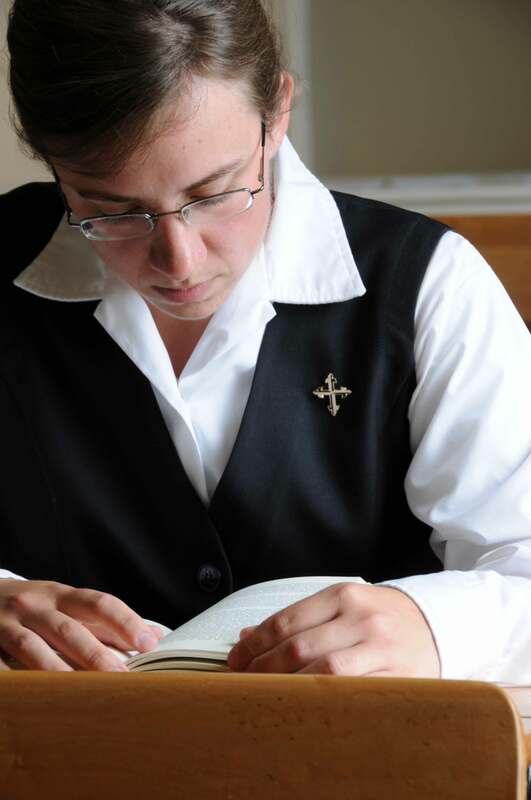 During this time period, the pre-postulant has contact with the vocation director and uses the time before entrance for spiritual and material preparations. The pre-postulant is encouraged to strengthen her resolve and to have an awareness of the spousal dimension of religious life. In this context, she is making a choice beyond life and career. It is a response made in love. 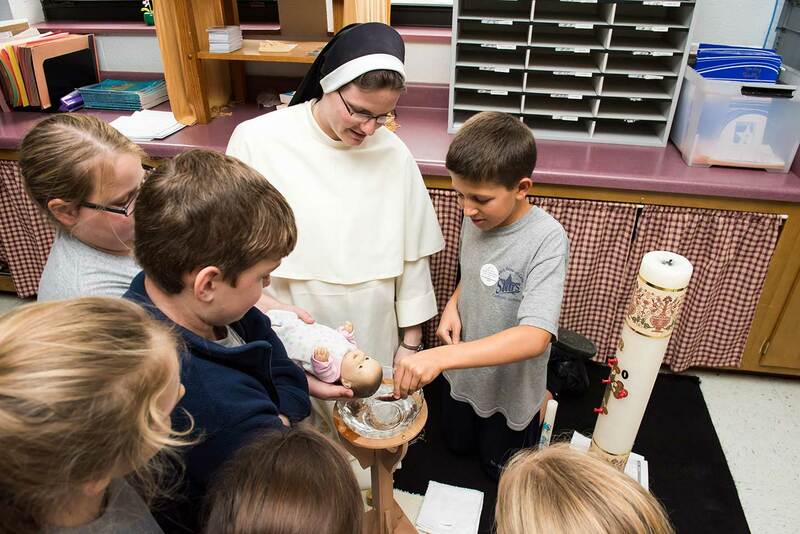 She is encouraged to frequent the sacraments, read Scripture daily, to have a program for her spiritual life and to read works about Dominican spirituality. 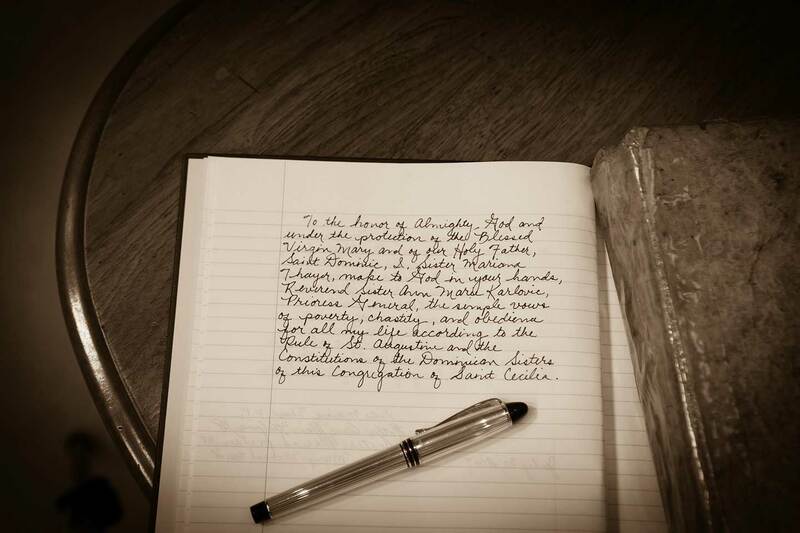 After a simple entrance ceremony, the postulant begins a year of immersion into the life of her new religious family. She attends all community prayers and practices the monastic customs that are a part of our life. 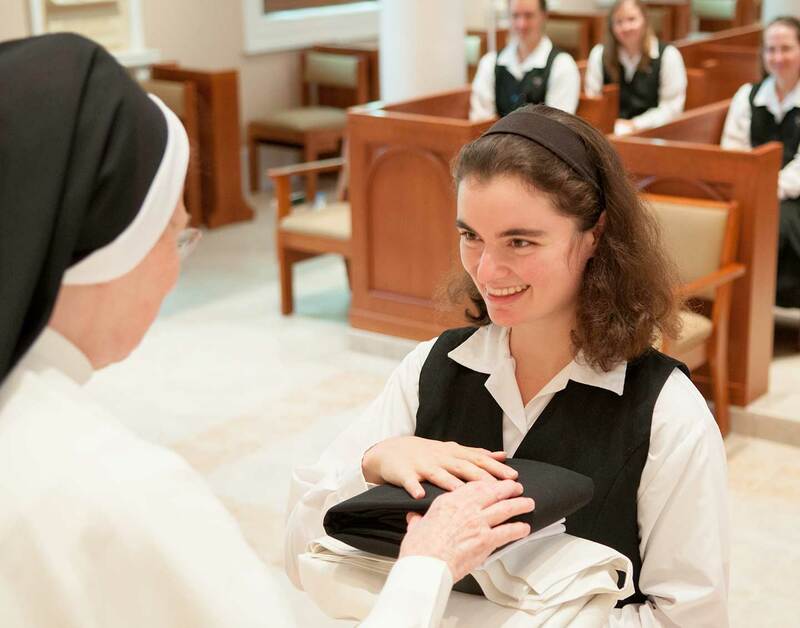 The postulant receives the guidance of the Director of Novices or her assistant, who guide her to grow in virtue and self-knowledge. She learns of the joys and demands of community life. During this year she becomes acquainted with the basics of Dominican spirituality and history, along with the charism of our Congregation. 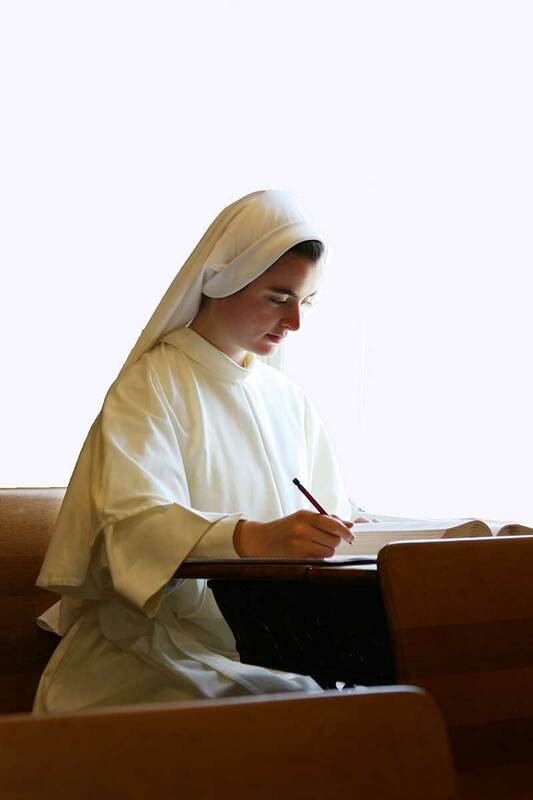 The postulant attends classes at Aquinas College where she studies philosophy and basic Catholic doctrine. 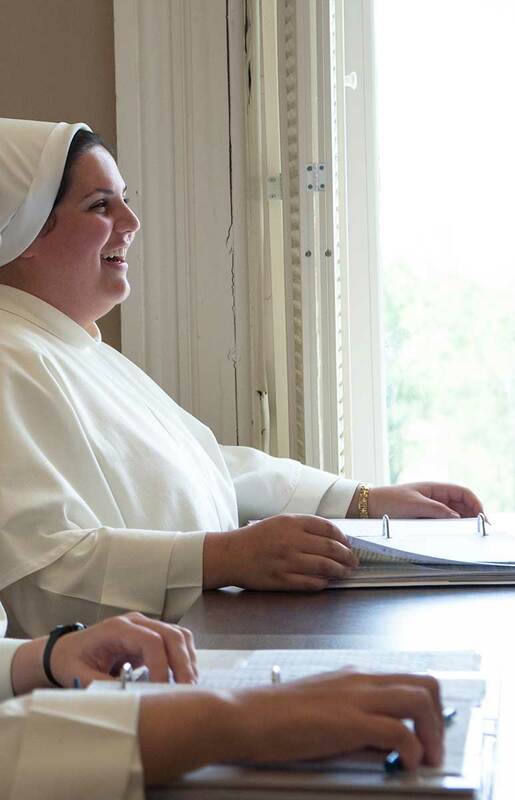 Her classes at the Motherhouse include the study of Sacred Scripture, the spiritual life, and Church history. 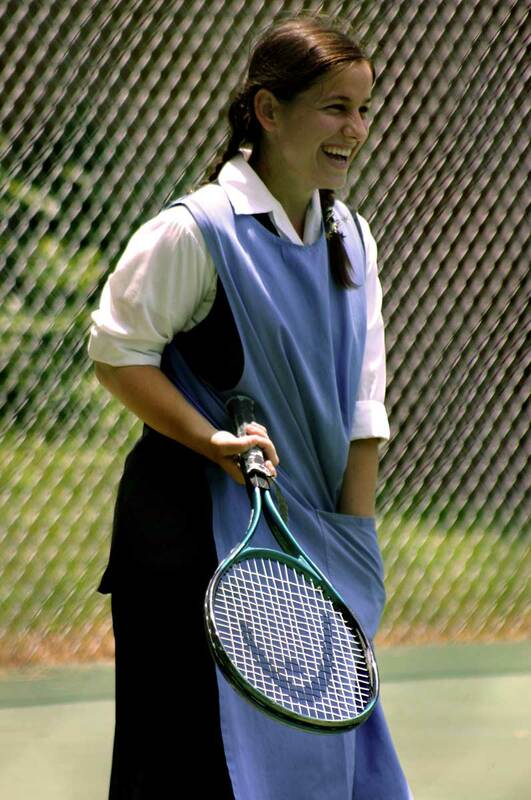 Her afternoons include a period of physical exercise, a house duty, and spiritual reading. 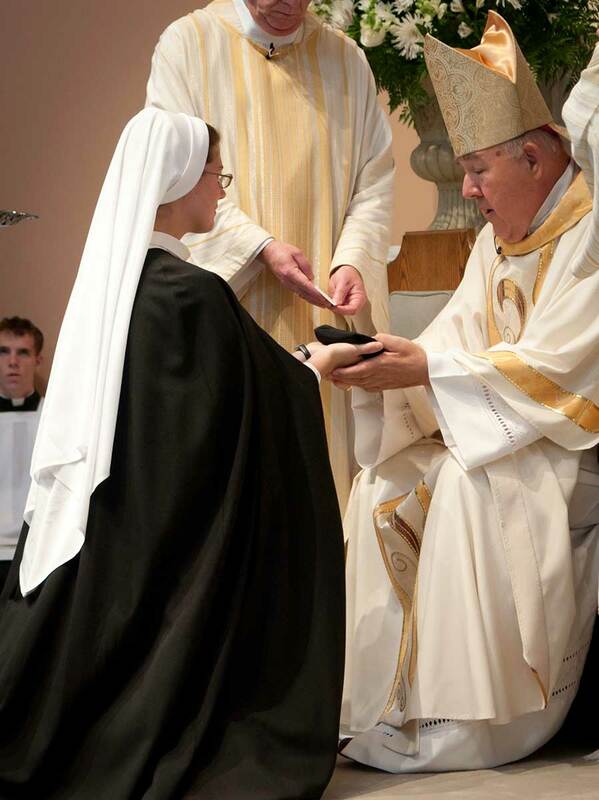 At the end of the postulant year, the sister receives the Dominican habit with a white veil, and her religious name. As a novice, she enters into a period of theological, philosophical, ascetical and spiritual formation. She is guided to see the essential link between study, prayer and preaching. The novice has an additional meditation period before the Blessed Sacrament each day. She also has additional time for silence, instruction, and study, thereby seeking to deepen her prayer life. 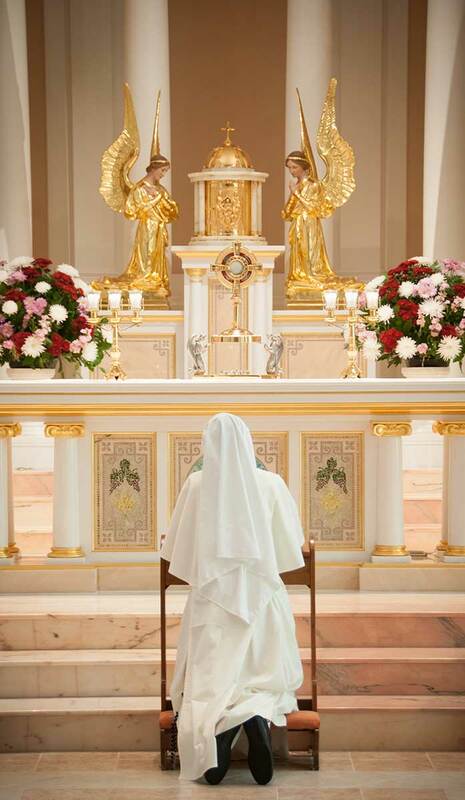 Her appreciation for devotion to the Eucharist is fostered in many ways, including her daily participation in the Holy Sacrifice of the Mass and the Liturgy of the Hours, as well as time for personal prayer. She studies spiritual theology, patristics, Scripture and the theology of the vows. 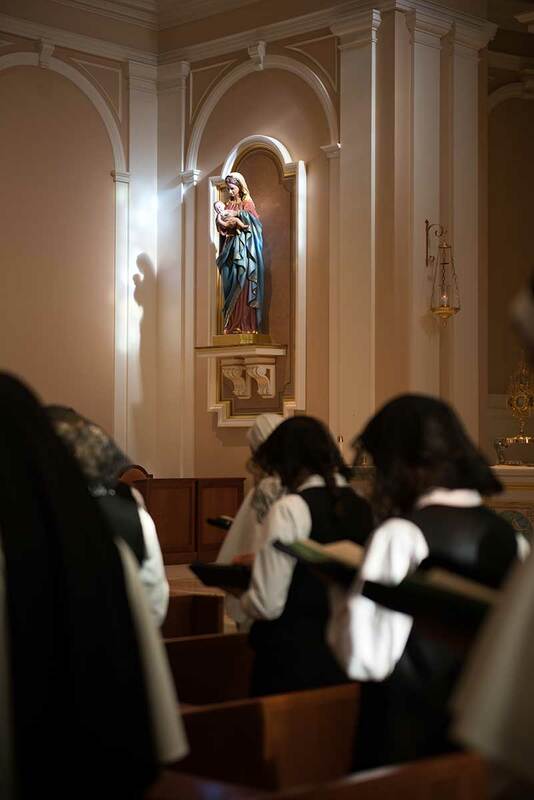 Devotion to Mary is fostered, as well as a strong fidelity to the teachings of the Church. She studies the Catechism of the Catholic Church, Canon Law, and Church documents, especially those related to religious life. The goal of the canonical novitiate is observable growth in love of God and neighbor, self-knowledge, and understanding of the commitment which the novice will choose to make. 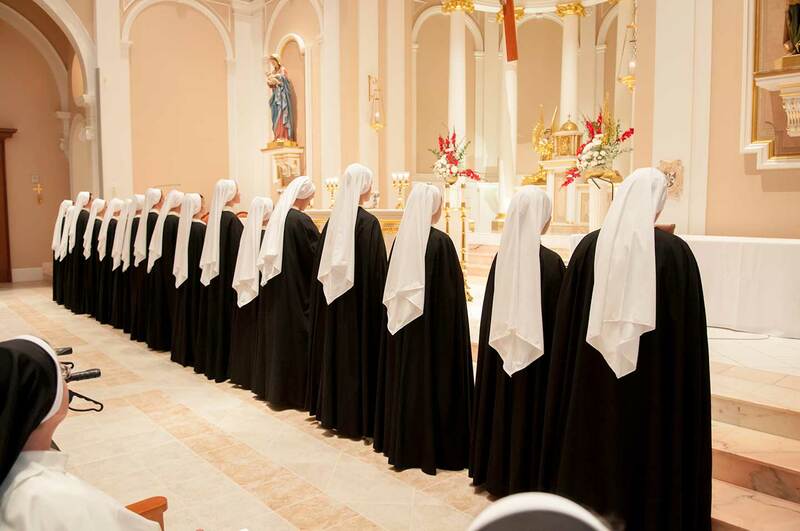 At the end of this year, the sister makes the vows of poverty, chastity, and obedience for three years. 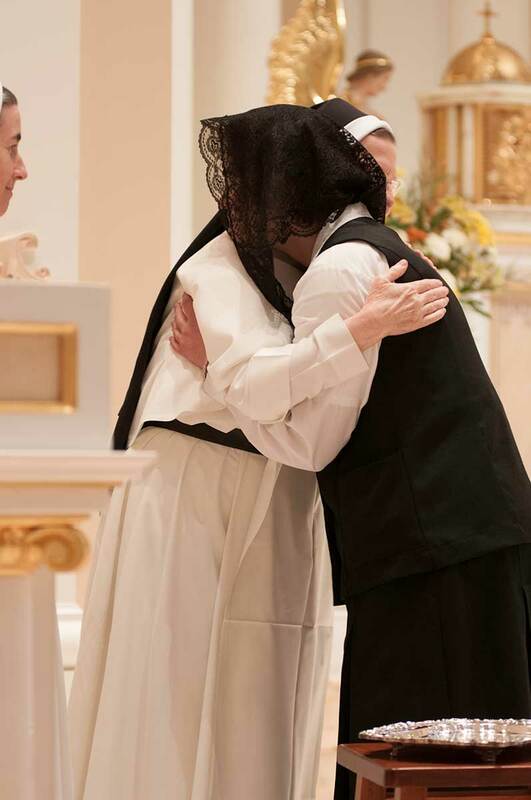 After making her First Profession the sister exchanges her white veil for a black one, symbolic of conversion, penance, and consecration to God. The two years after her canonical novitiate are spent within the novitiate community with continued formation where she receives guidance on the actual living out of the vows. The sisters continue their formation in the theology of consecration, of mission, and of the ecclesial dimension of religious life. Continued growth in personal conversion and prayer, charity, love of God and neighbor, and devotion to St. Cecilia and Dominican saints is emphasized during this time. The sister finishes her college coursework and obtains certification as a teacher. If she enters with certification, she may begin her work in the apostolate. 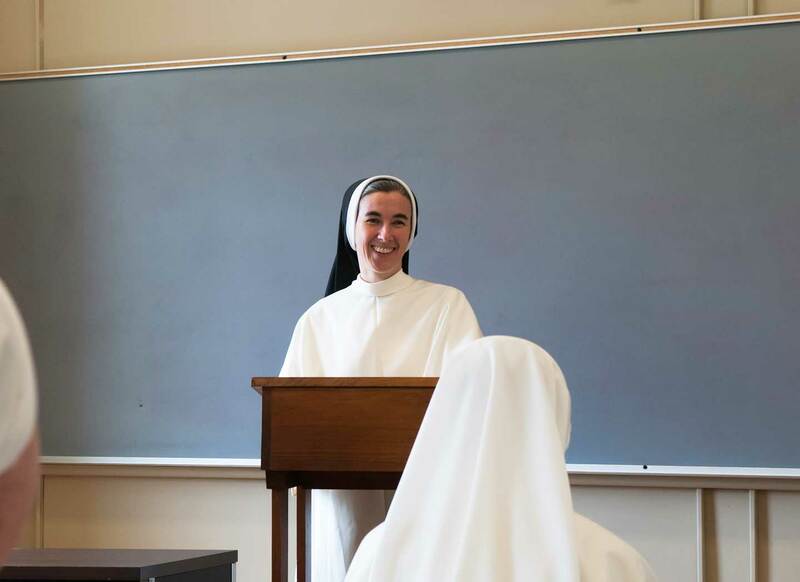 During the summer months, the sisters in the novitiate take classes in theology and philosophy on a four-year cycle. The coursework is systematic and foundational, with an emphasis on the works of St. Thomas Aquinas. After her four years in the novitiate, she enters the larger community and seeks to solidify the foundation she has gained. She may experience mission life with seasoned sisters of the Congregation during this time. 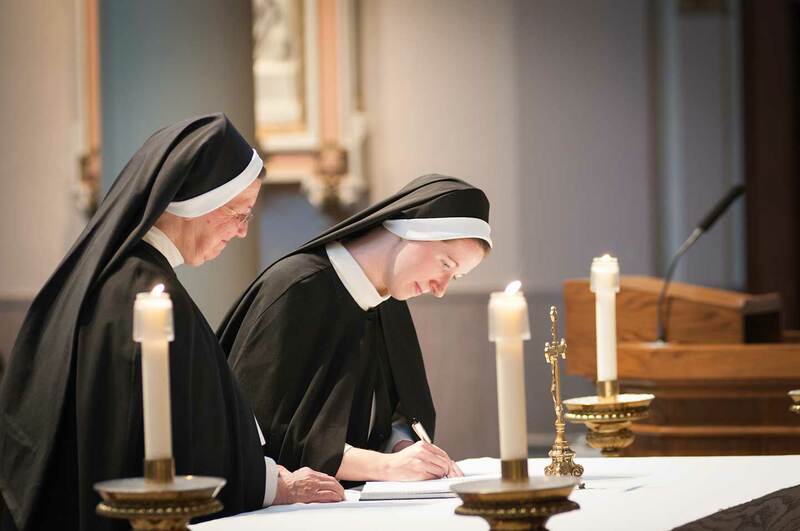 At the end of her first three years in vows, the sister renews her vows for two additional years. 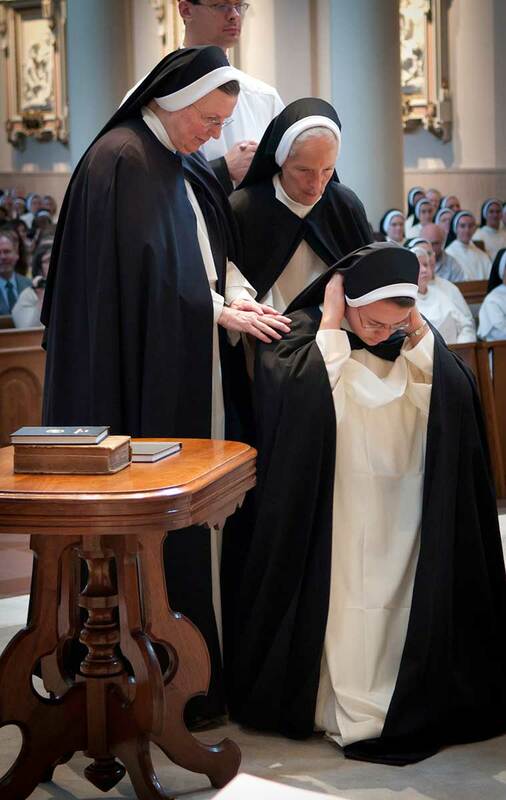 After five years in vows, the sister makes her profession of perpetual vows. The year prior to this step is one of more intensive preparation. 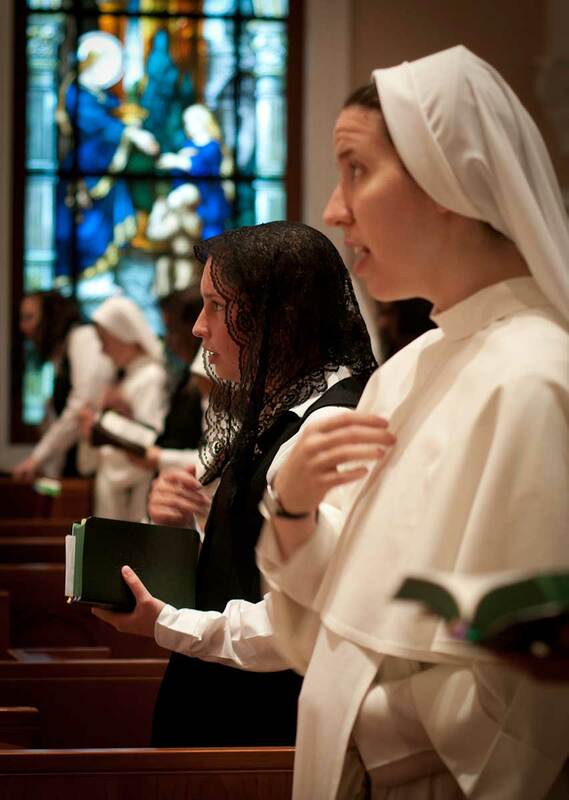 The words “for all my life” in the profession formula take on a profound significance as the sister promises to live in poverty, chastity and obedience, according to the Rule of St. Augustine and the Constitutions of the Dominican Sisters of St. Cecilia, until death. The sister participates in a program of ongoing formation which supports their formation after profession of perpetual vows. 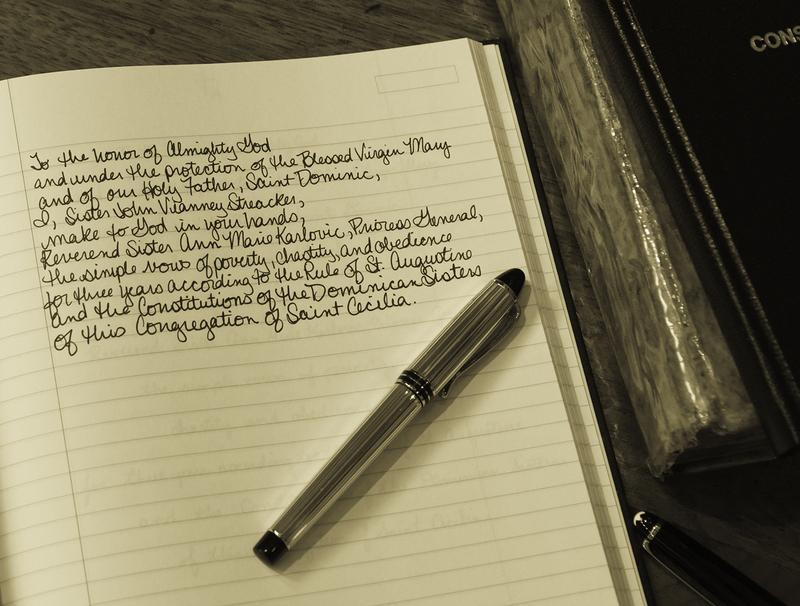 She begins ongoing formation studies upon leaving the novitiate and continues through her tenth year of final vows. Being joined to the Church in an intimate way, the sister makes its teachings the frequent subject of her reading, study, and meditation. During this time period, the sisters seek, as a community and as individuals, to deepen their faithful and obedient love for the Church. 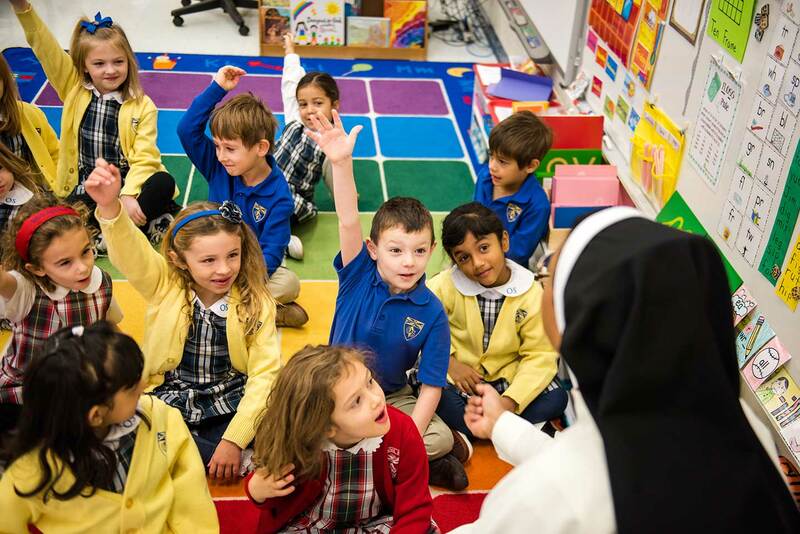 Through their work in the apostolate and their continued professional and personal studies, the sister contributes to the up-building of the Church and the mission and charism of the community.